Whenever I go visit my friend Adriana I try things I haven't had before such as grilled duck breast and fresh figs. Both were amazing and I am now hooked forever. 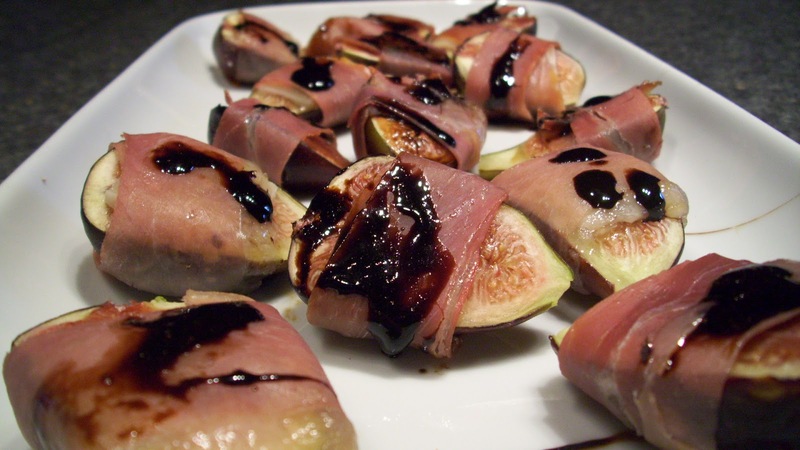 This fig appetizer is super easy to prepare and tastes like an appetizer from a five star bistro menu. While Adriana served me a green type fig I found black mission figs in my local grocery store for a fraction of the price. The taste is very similar. I tucked in slices of different cheeses in a few some to mix it up a bit. Wrap figs with prosciutto slices and arrange on a cookie sheet. Insert pieces of cheese under the prosciutto on a few if desired. In a small saucepan bring the balsamic vinegar to a low boil and reduce heat and simmer stirring until thickened. Place in oven until prosciutto starts to crisp. Arrange on a platter and drizzle with balsamic reduction and serve.